Admission to Oriel Mwldan is free. Opening times are 10am – 8pm daily. Mae Mynediad i Oriel Mwldan am ddim. Ar agor o 10yb – 8yh bob dydd. Although the processes are predominately print and I am keen to show the diversity of the area, the essence of the work is in the nature of its content. The contrast in scale, I hope suggests the significance or insignificance of the figure in landscape. Print as a vehicle for production has unending possibilities, here I hope, it is used to advantage in the narrative with process suggesting pace. Spatial concerns are still of interest to me and I suspect this will continue. Written by Paul Croft for Printmaking Today Winter Issue. 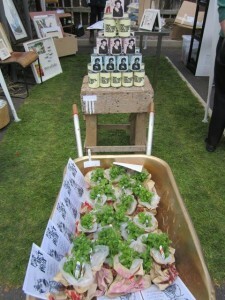 Exciting things are afoot in Wales in the World of Printmaking! …Pete Williams who recently completed residencies at Robert Blackburn’s Print Studio in New York (2011) and at Aberystwyth Arts Centre (2010) is something of a maverick and a pioneer when it comes to printmaking and sculpture. 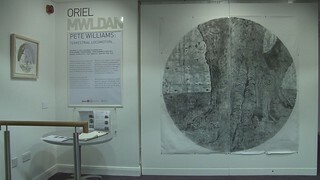 Williams has a reputation for being pro-active and for getting printmaking literally out on to the streets as occurred for The Wales Millennium Centre Hoarding Project and the series of extraordinarily large woodcuts that ended up cladding the Hetherwick pods at Aberystwyth Arts Centre. The Print Market Project located just a block down from Cardiff Printmakers started off as The Print Market Workshop in 1997. Originally housed at The Chapter Arts Centre, the studio run by Pete Williams has since moved to a refurbished nineteenth century barn across the road in Market Street. At this studio he has managed to develop an unique space for collaborative projects that range from graphic art through sculpture to installation and performance. As well as providing excellent facilities for etching, relief printing, screenprinting and lithography – there is also space inside and out for construction, carving and welding to occur. For Pete Williams ‘the real emphasis of the studio is to provide a professional platform, where like minded artists can make work that has an element of print within it ,no matter how remote’. The studio thus provides workshops and classes on the more unusual forms of printmaking such as large-scale woodcut, solar plate etching and screenprinting on to vertical surfaces. 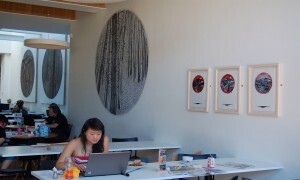 The workshop is also one of the few spaces in Wales to offer full collaborative editioning and recent collaborations have included Tim Davis’s suite of screenprints for the Venice Biennale; Mark Gubb’s prints that used burnt ash for ink and a number of etchings by Phillip Sutton that are due to be printed in the near future. Stephanie Turnbull who trained at Tamarind has become technical assistant and recently she helped print for Claire Woods for the Hepworth Gallery in Wakefield. 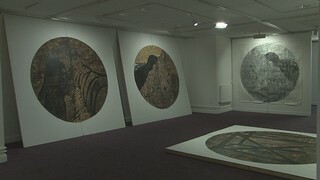 This exhibition marks the culmination of work which Williams began during a three – month residency at Aberystwyth Arts Centre. Initially consisting of drawings, photographs, notes and ideas it has transformed into prints and large-scale works produced specifically for Chapter. Utilising traditional methods of printmaking — woodcuts/engraving, lithography and stone — Williams uses print as a vehicle with endless possibilities. 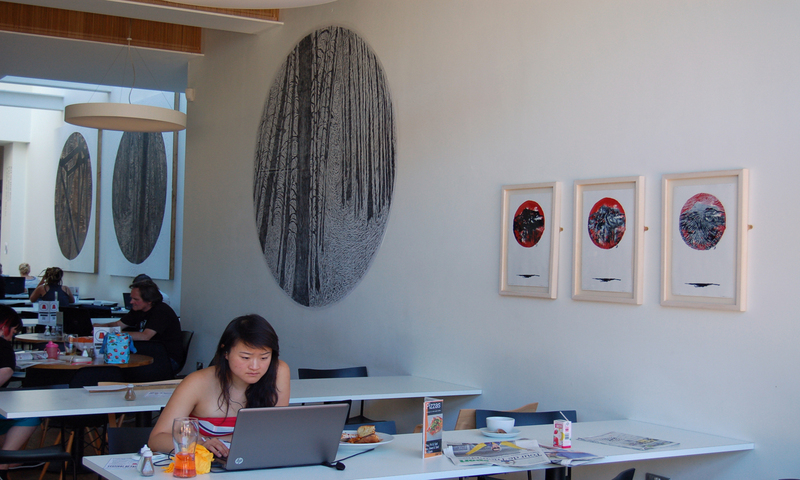 Each journey is mapped and logged in the form of a series of drawings and photographs that ultimately become realised as large woodcut block and prints, displayed here side by side on the Caffi Bar walls. The pace, time and distance is logged, which in turn informs the title of each work. A passion for running is a key inspiration in the work including the inspirational views experienced during Williams’ ‘journeys’ and the pace of running — methodical and rhythmic — which is replicated in the working and cutting of the block. Pete Williams studied at Cheltenham School of Art & Design and received an MA in Fine Art, Printmaking at Brighton University. He is currently UWIC Associate Lecturer in BA/MA printmaking and the Founder/Director of Print Market Project — a new Sculpture & Printmaking Workshop. Solo exhibitions include Open Studio, Aberystwyth Arts Centre; RK Burt Gallery, London (both 2012) and ‘New York Commercial’, Blackburn 20/20 Gallery, New York (2011). Group exhibitions include ‘New Prints’, Autumn International Print Centre, Chelsea, New York and Visual Arts Center at The University of Texas, Austin (2011). Forthcoming group exhibitions include ‘Between Spaces’, Aberystwyth Arts Centre Gallery (2013) and ‘New Works’, RK Burt Gallery, London (2012). Recent commissions include Hapus Ice-Cream Factory, Machen Mountain Sculpture Trail, Wales (2010); KALEID editions Gallery, London; Sydney Nolan Trust, Wales (both 2009). 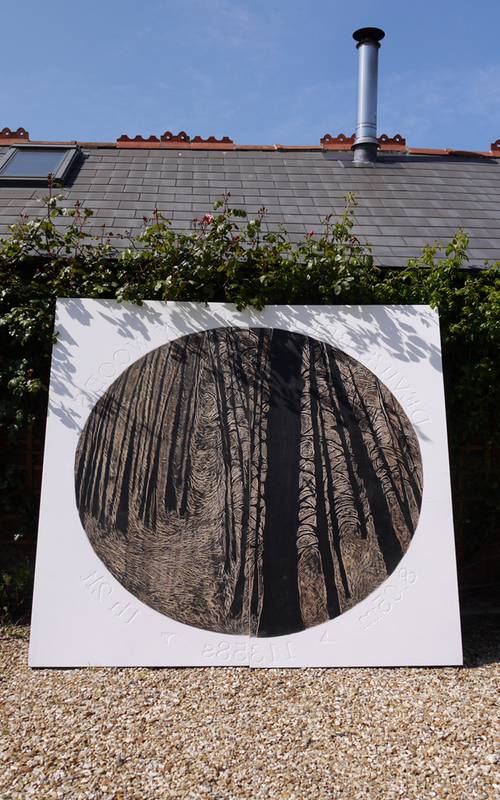 Williams was awarded an international collaborative residency with Robert Blackburn Printmaking Workshop in New York, including a solo exhibition (2011); Artist in Residence at Aberystwyth Arts Centre (2010) and International Artist in Residence at Leitrim Sculpture Centre, Ireland (2008). over 100 people came over to the studio to checked out the workshop.